What can an oak savanna ecosystem teach us about adaptive organizational strategy? How can old-growth forests help us learn to build mutually beneficial relationships? What if your company could distribute leadership the way a beehive does, using simple rules that guide and coordinate individuals to accomplish complex assignments? Our world is full of relationships, from business departments to supply chains to stockholders to member networks, and beyond. But we’re not the only ones who rely on relationships. Thanks to 3.8 billion years of ecosystem evolution, nature has much to teach us about how cooperative relationships can create more sustainable, resilient ways of doing business. In this recorded webinar, Dr. Dayna Baumeister outlines lessons from nature on the power of mutual, symbiotic relationships. Learn why nature fosters cooperation over competition—and discover how the fusion of biomimicry into social innovation can help you leverage relationships to foster productive, results-driven innovation that create thriving company cultures. How does nature do it? Download this shareable infographic capturing the four key criteria of mutualisms in nature! 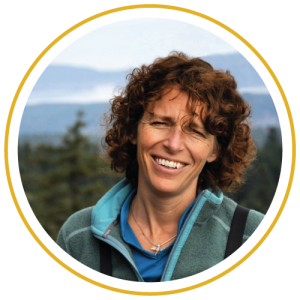 In this recorded webinar, Biomimicry 3.8 Keystone Dr. Dayna Baumeister goes deep into the insights behind nature's lessons for mutually beneficial relationships. Access is easy. Enter your email to reveal the webinar player below. Help us achieve our vision by sharing these biomimicry resources with the creative problem solvers in your network. Take our introductory self-paced online course and start building your foundation in the philosophy and practice of biomimicry.